epw024264 ENGLAND (1928). West Ham Football Stadium, Custom House, 1928. This image has been produced from a print. 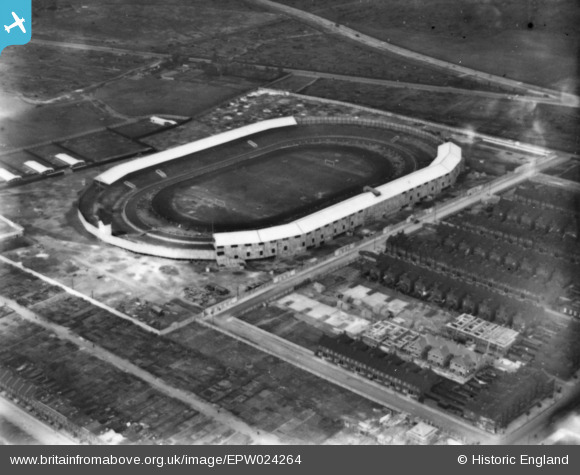 Title [EPW024264] West Ham Football Stadium, Custom House, 1928. This image has been produced from a print. Here seen practically brand new, the Stadium opened with a speedway meeting on July 28th 1928, greyhound racing following on August 4th, the 562 yard circuit the longest in the country. A speedway test against Australia attracted a claimed 82,400 crowd in 1933. By contrast the attempt to build a following for Thames FC failed with one League match famously attended by 469 spectators.